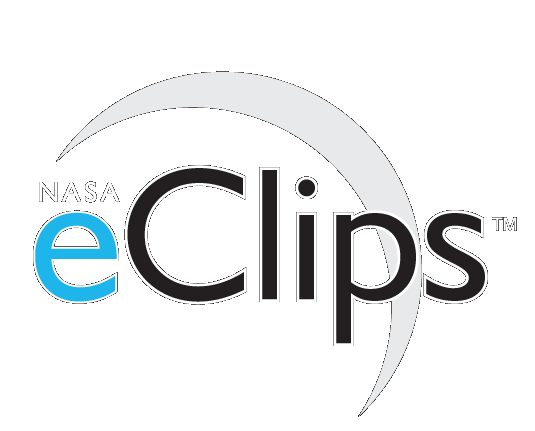 NASA eClips™ Educator Guides provide examples of ways teachers may effectively use video segments as an instructional tool. Each guide includes instructional objectives, background information, links to video clips, instructions for implementing inquiry-based lessons, additional resources related to the topic and suggestions for extending or modifying lessons. All lessons are presented in the 5-E delivery model and are aligned to national standards for science, math, and technology. Designing a Shower Clock allows students to think and act like engineers and scientists as they follow the five steps of the Design Process to successfully complete a team challenge. Within this work, students design, measure, build, test and re-design a shower clock. Once the shower clock is built, students discuss ways to conserve and recycle water. Crater Maps and Earth Landforms asks students to compare physical features of the moon to those found on Earth. Students first use a tennis ball and basketball to visualize scale relationships and distance between Earth and the moon. Students then use maps of the moon to identify lunar surface geography, comparing lunar landforms to similar ones on Earth. They learn how NASA uses satellite technology, such as the Lunar Reconnaissance Orbiter, to learn more about the moon. Dirt guides students to use two separate KHWL (Know-How I Know- Want to Know- Learn) charts to organize their knowledge of Earth's soil and moon dirt. Working in teams, students create several slides of Earth soil for analysis. Through NASA eClips(TM) video segments, students review the rock cycle for rocks on Earth and learn about three types of lunar rocks. Students analyze simulated lunar regolith to make inferences about the formation of regolith. Student understanding is assessed using overlapping circle Venn diagrams. Insulators introduces students to thermal insulating properties of different materials. Students review their understanding of insulators and conductors and extend this understanding to the Hubble Space Telescope's thermal blanket. They work in teams to test the insulating properties of cups made of three different materials and use the design process to improve the insulating properties of the best performing insulator from their previous experiment. More than Just Dirty Snowballs guides student teams in grades 3-5 to create ice cream comet models to be analyzed by another team of students. They evaluate basic facts about comets to determine how scientists discovered this information. They explore the Stardust Mission and Deep Impact Mission and discuss the scientific contributions of each mission. Keeping the Beat has students in grades 3-5 measure and record their pulse rate before and after physical activity to learn more about the heart. Students have the opportunity to use a math model to look for patterns in the pulse rate data. They participate in a cardiac relay to deepen understanding of the circulatory system and make observations of gravity's effects on a water balloon to learn about its effects on water in the body. Thinking and acting like scientists and engineers, students learn more about the design of exercise equipment to keep astronauts healthy in space. Rose Colored Glasses - A New Camera for Hubble teaches fifth and sixth grade students about visible light, wavelengths of different colored light and the electromagnetic spectrum. Working in teams, students observe images taken by the Hubble Space Telescope through different colored filters and analyze how the filters affect what they can see. This models one of the processes used by Wide Field Camera 3 on board Hubble Space Telescope to collect information about the universe and how NASA scientists use this information to learn more about the universe. Recycled Crew Exploration Vehicle asks students in grades 4-5 to compare NASA's new Orion space capsule to the Apollo space capsules. Students then design their own capsule and transform a 2-D drawing into a 3-D model using recycled materials. Students utilize a design process to create and evaluate their designs. Measuring Atmospheric Heating asks students to think and act like engineers and scientists as they conduct an inquiry experiment about aerodynamic heating using everyday inflatables - balloons. Students discover the difference between qualitative and quantitative data; collect, organize, and interpret data; and use their data to explain transfer of heat energy. The Light Plants Need asks students to observe and compare three types of light sources. They then conduct an experiment to determine how different colored light affects plant growth. Students analyze data collected from the experiment by creating a line graph and calculating three measures of central tendency. Finally, students design a plant growth chamber to observe the effects of colored-plastic, filtered light on plant growth. Students have an inside look at an atmospheric chemist's career. Measuring Raindrops asks students to look at NASA technology and how the study of clouds provides scientists with information about the global environment, weather patterns and climate changes. Students then collect and analyze data about the size and shapes of raindrops. They have the opportunity to compare a 2-D representation to a 3-D representation to understand why scientists use multiple sources of data to study Earth Systems. Students may also build a simple cloud chamber. What Causes Global Climate Change demonstrates student attitudes towards and prior understanding of global climate change. Working in teams, students then observe, measure and record data gathered from simulated ice core samples to model the work of climate scientists. Students graph and analyze real ice core data looking for patterns and trends, as well as analyze graphs and models developed by climate scientists. Polyimide Foam introduces students to sound and the properties of polyimide foam. They investigate the sound insulating properties of different materials. Thinking and acting like engineers, students use the design process to find the most effective and cost efficient combination of materials to suppress sound. Abiotic Conditions challenges students to lift an ice cube floating in water using only a piece of string and salt. This introduces students to the concept of water's phase changes. Students investigate the freezing point of distilled water and solutions and modify and perform a self-designed experiment. Self Healing Materials has students look at NASA technology and how advanced materials are being developed and projected for use in many applications. They make a simple polymer, explore its properties and investigate what effect changing the proportion of ingredients has on the properties of the polymer. Analyzing Spectra introduces students to the concept of line spectra and how they can be used as an analysis tool. Students are first introduced to the concept of visible light and the fact that white light is made up of different colors. Working in teams, students construct a spectroscope and observe and analyze different light sources. They are then challenged to apply their knowledge to identify the composition of an unknown. Biomes teaches students about the Earth's ecosystems or biomes. Students explore the six spheres within the Earth system and discuss how they are inter-related. Next they focus on the individual biomes within the biosphere. Finally, students examine coral reefs and investigate how they are affected by water temperature. Lunar Habitats - Home on the Moon teaches students about the design of lunar habitats and then as teams explore the mathematical relationships between length, area, and volume by exploring the volume of cubes. Students apply what they have discovered by manipulating the scale of one proposed design for a lunar habitat. Working as a team, students compare the size of the lunar habitat to the size of a one bedroom apartment. The Colors of Ice introduces students to the topics of polarized light and birefringence. Working in groups, students use polarizing films to examine the crystal structure of ice. They document their results using digital images and organize their work by creating a multimedia presentation. Students apply what they have learned by creating 3D sculptures to be viewed through cross-polarizers. Students analyze cross sections of natural and manmade ice to transfer learning to a real-world application. In Case of Emergency introduces students to NASA technology and how basic laws of motion relate to spacecraft safety. Working in teams, students conduct an experiment and analyze data to explore projectile motion. Then, students are challenged to apply their knowledge to develop a working model of the Orion launch abort system. Making Waves asks students to organize different energy images into a logical pattern. Working in teams, students investigate and research different sections of the electromagnetic spectrum and share their findings with the class. Students are challenged to apply their knowledge to determine relationships between wave frequency, wavelength and energy of electromagnetic radiation. Cooling Off introduces students to the challenge of maintaining temperatures while in space. Thinking and acting like scientists and engineers, students learn to measure specific heat capacity and design an improved cooling system like those used in spacesuits. Students utilize a design process to create and evaluate their designs. Students think and act like engineers and scientists as they follow five steps of a Design Process to successfully complete a team challenge. Students view the NASA Spotlite Clouds video that corrects the misconception that: a cloud's only purpose is to produce precipitation. Within this work, students design, measure, build, test, and re-design a cloud cover estimator to measure the amount of cloud cover in the sky. Once the cloud cover estimator is built, students discuss the role clouds play in Earth's energy budget.